If you have never taken a look at a planted tank style of aquarium, you would likely be astonished at just how lively and vibrant such an aquarium appears to be. 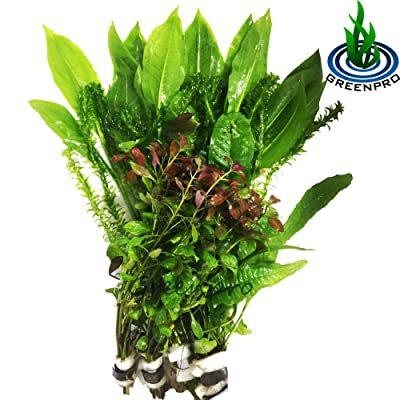 That is due to the fact that the plants used in freshwater aquariums provide the water with natural filtration, help to keep your fish healthy, and can also help in breeding small fish. Aquarium plants are utilized by fish for various things such as comfort, food, safety, and proliferation, so they are indispensable to any healthy and vibrant aquarium environment. If you are planning to start a planted tank for aquarium but don’t know how or where to begin, take the time to carry out some research. Most aquarium plants are tough enough to stand against changes in water chemistry and temperature as you become accustomed to maintaining a planted tank, however, some are superior to others. In this article, we will discuss the 10 best plants for freshwater aquariums available on the market today. If you are new to aquarium planted tanks, these are the best choices to start with. How to Care for Freshwater Aquarium Plants? Keeping aquatic plants in your freshwater aquarium is not that difficult. With a little direction, knowledge, and practice, you will quickly enhance your success rate. There are various aquatic kinds of plants you can choose for your freshwater aquarium. You have a choice of a variety of aquatic plant when setting up your planted tank. There are some plants that float on the aquarium surface, while there are some that stay rooted at the base. Some are utilized for mid-ground and background. We will examine the 10 best aquatic plants for freshwater tanks, that all look amazing in your aquarium and have different various purposes. These plants are very popular plants for a freshwater aquarium and are likewise a solid favorite of lovers of shrimp, as they provide extraordinary hiding places for them. The Java Moss is best appended to ornaments present in your aquarium tanks, such as rocks or driftwood. To do this, you will have to utilize elastic bands or a similar item to support the live aquarium plant while they gradually get rooted to the ornament. If you append it to a rock, it will grow outward across the tank’s surface. This plant is well-known to float, so it is best to attach it to something stable that can prevent it from floating away. The Java Moss plants do enjoy marginally dimmed light. They will thrive in lower light, but be careful if the light is excessively strong or the inverse effect will occur. Brilliant light will stunt Java Moss’s growth and could subject it to the plague of green algae. It will look fuzzy and green on the ground and endures a temperature of 70°F to 90°F but grows best in about 70°F to 75°F. This is an amazing plant for freshwater aquariums. It can be grown in a wide range of conditions, and is surely a standout among the most well-known and easy-to-maintain freshwater plants. Amazon Swords usually grow very large in the aquarium, so you need to keep this in mind before buying it. These are good for new users because they survive well with only a low level of nutrients and lighting. However, with the inclusion of liquid nutrient supplement and a high level of lighting, the Amazon Sword will start to grow very fast in your freshwater aquarium. 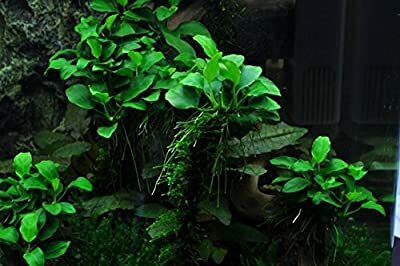 Amazon Sword plants are generally the first choice of plants for beginners since they can be easily acquired from aquarium stores at a low price. They originated in South and Central America. However, today they are mostly grown in North America and dispersed to hobbyists. The Amazon Sword needs direct lighting and temperatures around 72°F – 82°F. These aquatic plants have leaves that look like swords (as its name implies) and they usually grow tall—up to 20 inches tall! Like Java Moss, this is a plant that’s great for freshwater aquariums, that works well with shrimp. The Java Fern likewise prefers low light, and they grow fine when their rhizome (i.e. the green stems which bring forth the leaves) are attached to an ornament or rock. If you have larger Java Fern plant, then you can cover its roots with rock, but you must be watchful when you do this in order to prevent the rhizomes from being buried. 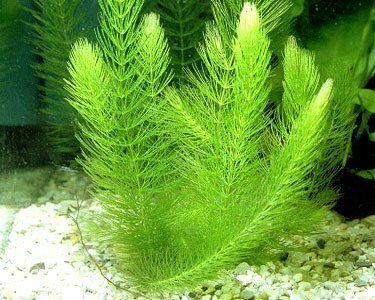 Its long, clustered green leaves flourish in 68°F – 82°F water temperature, in low to moderate light, and it serves well both as hiding spots for fish and as a background decoration. 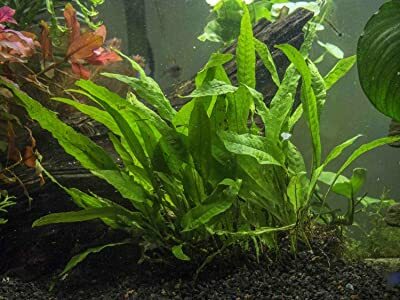 Java Fern is a live plant that is simple to grow in your freshwater aquarium, as they discharge spores from the front part of their leaves when it is time for propagation. These spores will just float about until they discover something to tie themselves to, and afterward, they will grow faster. The required light and water temperature make the Java Fern a great solution for newbies wanting to attempt freshwater plants. These aquatic plants are not expensive and can often be obtained in a variety of sizes for bigger or smaller aquariums. Java Ferns won’t require any plant-specific substrates or liquid fertilizer supplements. Anubias and Anubias Nana are two easy-to-keep aquatic plants for your freshwater aquarium. Anubias is usually sold on rocks or driftwood in the aquarium store. Unlike the Java Fern, this freshwater plant grows slowly. It’s therefore essential to purchase a specimen that already properly fits the size of your aquarium. Once acquired, make sure you keep the plant above the substrate and don’t cover the bottom of its root in the substrate. 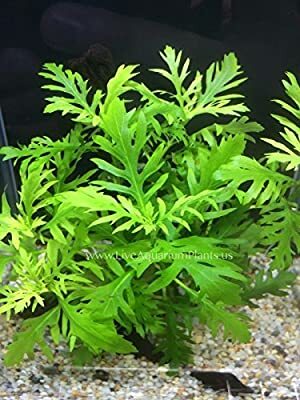 This freshwater plant needs to be in the shady part of the planted tank with an ideal flow in order to prevent the growth of algae on the leaves. The Anubias plant needs only a low level of nutrients and therefore doesn’t require any fluid fertilizer to be added to the water. Anubias Nana is a variation of anubias with much smaller leaves. It is more appropriate for smaller or Nano aquariums. This plant is difficult to get and usually comes at a higher cost. The greatest advantage of this aquatic plant is the measure of coverage it gives. If you are breeding fish that love hiding, or require hiding places in your aquarium tank, this is really the perfect plant to get. It doesn’t grow above 6 inches, so you will not have to worry about always having to trim it. It requires 72 to 78°F water temperature and moderate lighting. Crypts are great plants that are normally displayed in pots in neighborhood fish stores. Crypts in some cases have a terrible reputation since they “liquefy” quickly upon addition to the planted aquarium. This is due to the fact that crypts are less resistant to change compared to other aquatic plants in this rundown. They likewise require a slightly higher amount of light compared to other plants. Hence, they should conceivably be left as an aquarium plant for the marginally advanced aquarist. In any case, they are a good-looking foreground plant that can be recognized by long slim leaves stretching out from a focal point below the substrate. However, upon addition to the planted aquarium, it might appear as if this plant has totally dissolved, but the Crypt is only responding to change. As you keep tending it, the crypt will have the capacity to return to full health as it develops its new root framework in the freshwater aquarium. Another benefit of this plant is that it can be effectively split at the rhizome area and propagated all through the aquarium. These live plants for freshwater aquariums can vary widely in size, color, and shape. 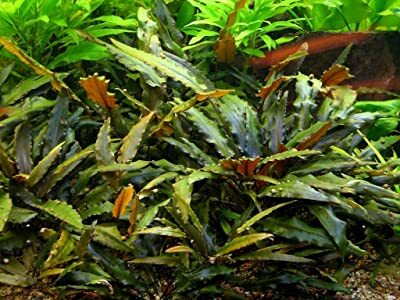 Cryptocorynes comes in a wide range of varieties, yet regardless of what they look like, they are extremely popular with shrimp. Advanced aquarists consider these plants to be the “next step up” from Java Fern and Anubias. They still enjoy dimmed light, however they require somewhat more care because of their complex roots. They should be covered at a depth of 2 inches on the rock, however, you should take care to guarantee that the crown (the location of the leaves), is kept well over the rock. It needs 72 to 82°F water temperature and moderate lighting. You should be watchful with Cryptocorynes as they are very vulnerable. They can encounter what is regarded as the “Crypt Melt” situation, which usually happens when you first bring them into your freshwater aquarium. What actually happens is the sudden change in the water around them usually stuns the Crypts, and the outcome is that they frequently lose most of their leaves. Do not worry, however; this is very common and never lethal for the plant. This aquarium plant (otherwise called Narrow Leaf) is mostly seen in freshwater. It is a good choice of plant for both a beginner and expert hobbyist. It is normally kept closer to the edge of the aquarium as it doesn’t grow extremely tall. In proper lighting, it can grow to be a thick tangle of foliage. In low lighting, it will grow sparsely. It will have the capacity to survive in any lighting conditions and does not demand a fertilizer supplement. The Pygmy chain sword is widely known as an outstanding plant for beginners since it demands almost no upkeep. The plant will spread over the substrate (material used to cover the base of an aquarium) voluntarily. The plant can then be permitted to propagate in order to grow over the front elevation of the aquarium, thereby forming a stylish foreground. 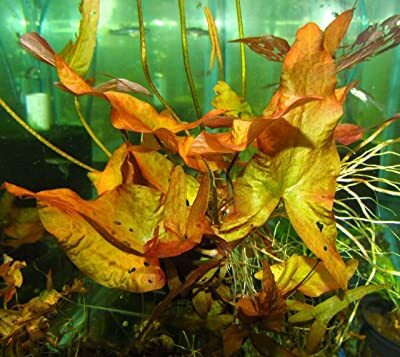 Under better lighting conditions, the new leaves that sprout on this aquatic plant will develop a brilliant red color. This dazzling coloration is frequently the centerpiece of the aquarium and prized by numerous aquarists. This plant is also tolerant of a broad range of conditions. 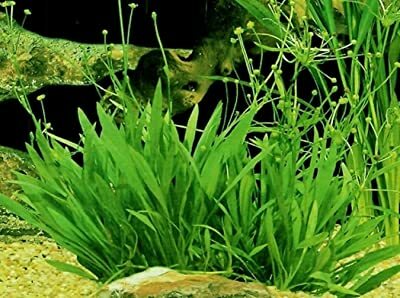 It can flourish in hard or soft water, low or high pH and an extensive variety of temperatures, thereby making it a superb plant for beginners and a preferred choice for every aquarium. This species of aquatic plants is also called “Bunch Plants” and they are a popular choice among shrimp-keeping aquarists since they root deeply into the aquarium tank and make pleasant spots for the shrimps to explore and navigate around. Water Wisteria is particularly well preferred because of the shape that their leaves take, which are generally fascinating. This aquatic plant will flourish in any conditions as long as they root well in the gravel and they have enough oxygen. Water Wisteria is likewise one of the most easily propagated freshwater aquatic plants. All you need to do is to clip off a healthy long stem. Then, bury it in the gravel about 3 to 4 inches deep in the aquarium while the plant continues the germination process. Water Wisteria has tall lace-like green leaves that could provide an excellent green carpet-like cover for your aquarium. They spread out broad as opposed to developing tall. These plants are widely known to grow easily and require minimal upkeep. They require direct light and do well in the temperatures range of around 75 to 80 degrees. Otherwise called Coontail, Hornwort is one of the less-difficult plants to keep in the aquarium. It is commonly sold in pots and floats freely on the surface of the aquarium. It is exceptionally versatile to changing conditions and has the ability to survive a wide range of temperatures. It is also appropriate for cool outdoor ponds and water tanks. Hornwort can achieve a length of up to 24 inches. This aquatic plant can be propagated by simply cutting down the stems and giving them a chance to float around. Another way is to replant them in the substrate. It is a brilliant background plant because it develops to the aquarium’s height. The Hornwort needs a minimal lighting and negligible fertilizer supplement. In the wild, Hornwort is commonly found in sloppy conditions joined to the substrate or floating freely in water bodies. In the aquarium, either is suitable. Nevertheless, it is highly recommended to plant Hornwort in the substrate. This allows your lighting to reach the underlying plants. If the plant floats freely on the surface, it can hinder a portion of the light from reaching the underlying plants. These are extremely delicate plants that grow slowly. In spite of the fact that shrimp seem to like them, they are easily damaged, so it may not be a smart idea to plant dwarf lilies if you have numerous shrimp circling around. Dwarf lilies look like little-pointed heads, and their tiny stems can break easily. If you wish to have dwarf lilies in your tank, it would be ideal if you could purchase older ones that have been allowed to grow fully. Then there will be a lower likelihood of breakage and you will additionally abstain from purchasing freshwater aquarium plants that do not have the ability to reproduce. Aquatic plants provide a lot of advantages to your aquarium. While having a staggering visual effect, these aquatic plants circulate air through your water, eliminate impurities and provide a sound habitat for your fish to flourish in. It has been observed that if you take care of your plants appropriately, algae will not be an issue. By making use of the guidelines below, you will be able to make an attractive and healthy aquarium that you can enjoy. Nurturing your plants starts with picking the ones that are appropriate for your aquarium. Ensure the plants you pick are affirmed as underwater plants, meaning that they can survive totally submerged in water. Examples of aquatic plant species that can be easily grown in aquariums include Anubis, Echinoderms, Anarchies and Lilaeposis (Sword Plants). Remember that most plants like a pH level of 7 to 7.2. Make sure to check the compatibility of each plant with your fish (because some fish eats plants) and water conditions. Aquarium plants require substrate in which to firmly fix their roots. These plants can grow in many kinds of substrate, but about 2–3 inches of laterite surrounded by an inch of gravel would be perfect. It is possible to keep your plants inside the pots in which they were sold. Nevertheless, planting them in substrate gives a more natural look, and is more helpful for the development root. Without appropriate lighting, your plants can’t survive. Plants require light for photosynthesis, which is a process in which plants create energy for growth and development. An additional advantage of photosynthesis is that oxygen is produced for the intake of the aquatic life present in your aquarium. Full-range, fluorescent lighting is an absolute necessity. Ensure you give your plants about 10 to 12 hours of light each day. Make sure you replace your fluorescent light bulbs every 12 months, as their intensity tends to fade day by day. If your light bulbs fail into emit full spectrum light, your plants won’t flourish. You can improve plant development by including an iron-based fertilizer that is safe for the fish. Search for moderate-release fertilizers that are intended to help in freshwater aquarium plants’ development and growth. Never make use of phosphate fertilizer, as algae tend to grow vigorously on phosphates. Overdosing your aquarium with fertilizer can kill both the fish and the plants in the water. Try not to buy a fertilizer that contains nitrates or phosphates. It can lead to horrible algae problems. Fertilizers are usually accessible in pelleted and fluid form. Just a few of the easiest freshwater plants were listed. There are still many more aquarium plants that are appropriate for your aquarium. All the plant’s list doesn’t need any CO2 addition, elevated lighting or fertilizer supplement. Most will do well to battle algae and flourish in a low-tech setup. Although able to flourish with low light arrangement, some of the plants can likewise develop well and make use of high light arrangement. When some of these plants are presented to high light, their color intensity changes. What about for very small tanks? Like 1.5-2 gallons? Plant/substrate recommendations? Your tank is far too small for a fish let alone any plants. Go buy a bigger tank. 1-5 gallon tank is great to start aquatic plants and maybe a couple of shrimp. I have a 2 gallon freshwater tank with a dwarf sword, a bit of java moss, an anubias nana, 2 ghost shrimp and a black racer snail. All have been thriving for a year now. I’m feeling confident enough to do a 10g planted tank with -gasp- guppies! I have a 14-gallon tank with beautiful fishes in it, what plants should I start with? and how can I grow plants with fishes living in it? Your tank is not too small. The fish store I use in Memphis, called Memfish, has several tanks set up on there counter that are smaller than 10 gallon. Some are freshwater some are saltwater. You don’t have to have a large tank for it to be a saltwater tank. does java moss need to be pruned? can it grow too much and cause harm to the fish? It can grow a lot. It doesn’t cause harm to the fish–in fact, most fish love it as it gives them shelter–but if you don’t prune it back it will take up a lot of space. what can I put in my outdoors (so Cal) goldfish tank – 20 gallon. goldfish eat everything…… any suggestions? Java moss. It will probably grow quicker than the goldfish can keep up with eating. Looking to house plants in a 55 gallon aquarium with tetras—-any online places to get plants from that you would recommend? Should be the “9 best plants.” Couldnt even separate 5 and 6 to make it seem like they’re two different plants? i’m getting a 20 gallon long with 2 cherry shrimp, an apple snail, 3 rosy red minnows, 4 zebra danios and a fancy goldfish. i want to have a lot of plants to give it a more natural feel but don’t know what plants to get. You shouldn’t really have a goldfish or a snail in with your otherwise tropical tank. Goldfish and snails are both typically kept in cold water, while everything else is going to be in kept in the mid-high 70’s…you can actually “cook” your snail alive. 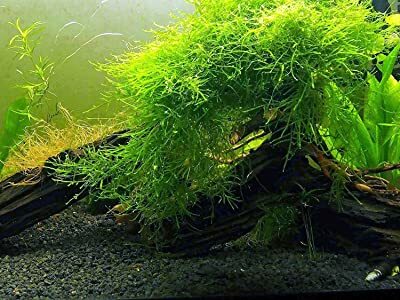 I’d definitely get some java moss and wrap it around driftwood and/or rocks with fishing wire until it attaches on its own. Pygmy chain sword & hornwort plants are both very flexible in regard to their needed temperatures & PH. They also don’t need fertilizer or tons of light, and as a bonus, shrimp like them. I enjoyed this site. I am in the beginning thoughts of creating a planted 20 gallon tank. I have researched and settled on Eco-Complete. I have also read that a fine, tighter material will really help with growth and rooting. Therefore, I want to place – as a first substrate – Samurai Soil, then covering that with the Eco-Complete. Both – especially the “Soil” – states that it maintains a neutral ph as possible. Will one balance the other which can lead to a faster cycling? Will both remain stable for a long time, or will the “Soil” breakdown under the weight of “Eco” and time and turn to mud?